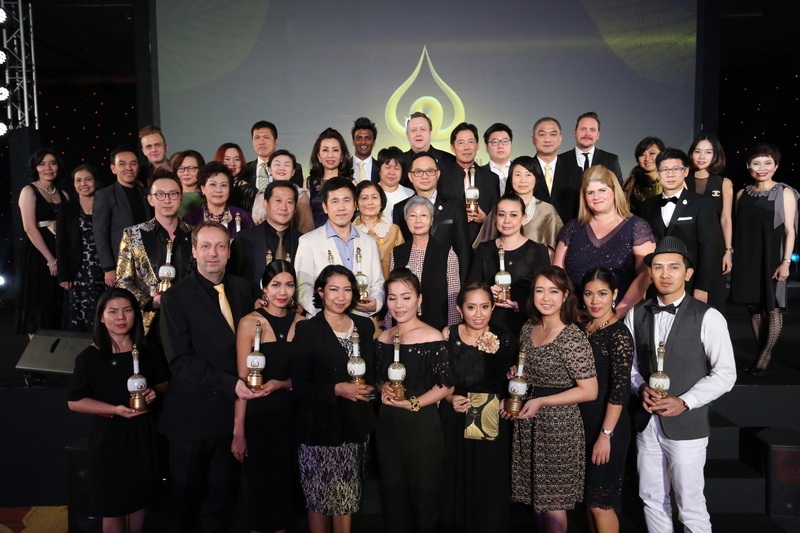 THE TWO MOST HOTLY-CONTESTED trophies at this year’s Thai Spa and Well-Being Awards Night – for the top spa product and the most amazing spa — were won by Skin Ritual Collection – Face Care (I plus Q); and Panviman Spa, Panvinan Resortm Koh Phangan. Twenty-one trophies were presented at the black tie event, held at IMPACT Forum, Muang Thong Thani, Bangkok. The event attracted 110 award nominees. The awards covered four categories – exhibition, industry, people’s choice and Hall of Fame. Award for the Best Booth Design went to I plus Q and Sranrom. Innovative Spa or Wellness Cuisine: St. Carlos Medical Spa, Bangkok; Innovative Spa Treatment: Flower Power Collection, In Balance Spa, Novotel Phuket Vintage Park; Innovative Spa Menu: So SPA, Sofitel So Bangkok;Green Spa: Paradee Spa, Koh Samed; Creative Spa Design: S Sense Spa, Ekamai, Bangkok;Natural Product: I plus Q; Organic Product: Secret Elements ( I plus Q); Spa Product: Skin Ritual Collection – Face Care (I plus Q); and Spa Educator: DTC Spa, DusitThani College, Bangkok. In the people’s category, trophies went to New Spa: Let’s Relax, Mandarin Hotel, Samyan; Traditional Thai Experience: Spa Cenvaree, Centara Grand @ Central Plaza Ladprao; Amazing Day Spa: Let’s Relax Terminal 21, Bangkok; Amazing Hotel Spa: Spa Cenvaree, Centara Grand @ CentralWorld, Bangkok; Amazing Resort Spa: Panviman Spa, Panviman Resort, Koh Phangan; Amazing Medical or Wellness Spa: RarinJinda Wellness Spa, Chiang Mai; Amazing Destination Spa: RarinJinda Wellness Spa, Chiang Mai; Innovative Marketing Campaign: Let’s Relax Android App, Siam Wellness Group; and Amazing Value For Money Spa: Let’s Relax Spa, Terminal 21, Bangkok. The awardsnight was organized by the Thai Spa Association in conjunction with Department of International Trade Promotion and the Thai Ministry of Commerce, and supported by the Department of Tourism, Ministry of Tourism & Sports; the Tourism Authority of Thailand and the Department of Health Service Support, Ministry of Public Health, along with Grand Opera Thailand and Wongnai Beauty App.